01/28/17 Mirror photo by Patrick Waksmunski / Central Cambria's Max Murin decisioned Athens' Brian Courtney 3-1 to win the 138 pound championship in the Thomas Chevrolet Tournament. After his 3-2 loss to Athens’ Brian Courtney in the 126-pound final at the PIAA Class 2A Championships last year, Central Cambria’s Max Murin sat dejectedly against a wall in a hallway. A returning state champion, his dream of being a three-time state champ was dashed. He had his chance in the final 20 seconds of the bout, holding Courtney’s leg in the air on a shot, but he couldn’t finish it. The loss stayed with Murin throughout the offseason and made him work harder than he already had. He gained some revenge with a 3-2 win over Courtney in the Disney Duals and a 3-1 victory in the much-anticipated final at the Thomas Chevrolet Tournament. “It definitely motivated me a lot,” Murin said, “but it also taught me a lot. I think about that loss probably every day before practice, before every workout. It taught me to go out there and let it fly. I was too worried about winning and losing last year. I have to worry about going out and wrestling to the best of my ability. It may seem hard to believe that Murin has gotten better than last year, but it seems clear that he has. He’s 36-0 with 22 pins and eight technical falls, and he has improved his chain wrestling, moving from one move to another and constantly attacking and wearing down his opponents. Murin has dedicated his life to wrestling, and you can see that in the unbelievably crazy workout schedule he puts himself through. Murin will get up at 5 a.m. to lift weights with his dad, Mike, before he goes to school. His first two years at the high school level, he went to the Young Guns Wrestling Clubs in Altoona and UPJ after practice. The last two years, when the Red Devils don’t wrestle dual meets during the week, he’s been participating in practices and then driving four days a week to two Young Gun clubs in the Pittsburgh area. He’s been going two nights a week to Franklin Regional in Murrysville and then going two nights to Norwin in North Huntingdon, about 26 miles southeast of Pittsburgh. He says he gets home around 10:45 or 11 p.m. from those workouts. How many of us could up that kind of schedule? “Wrestling has definitely been really good to me, but it also takes up a lot of my time,” he said. “If you love something, I feel like you should be able to do it. I’m not the most naturally talented guy, but I feel like I definitely outwork most of the guys in the country. “A lot of my family members were worried about me burning out my freshman and sophomore year, but it kind of went the opposite way. I just started loving it more and getting more and more hungry to continue to get better. Murin, who is 151-5 with 85 pins in his career, has set a number of program records throughout his career, and he’s added to that list this year, becoming the school’s first four-time District 6 champion, being voted the Outstanding Wrestler in the process, and four-time Southwest Regional champion. 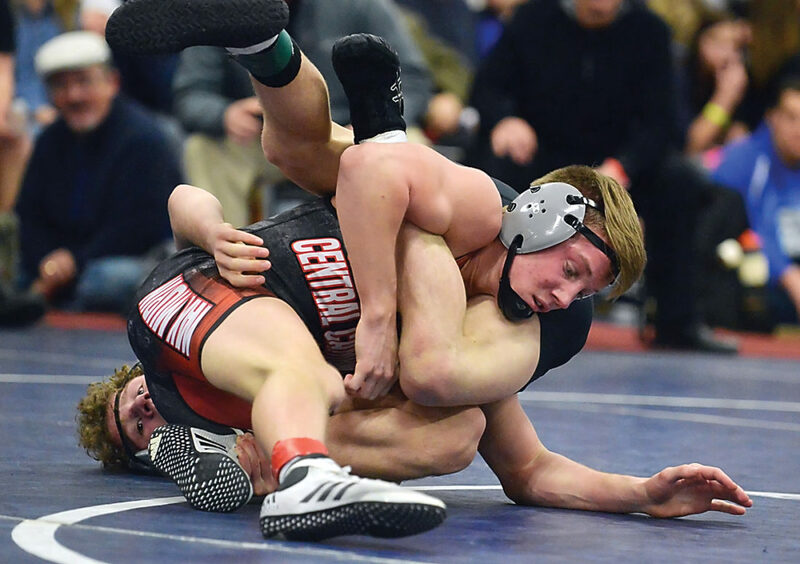 Murin has placed fifth, first and second, respectively, in his first three state tournaments, so he knows all about the pressure that wrestlers feel in Hershey. But he doesn’t seem to be too worried about it. “I think I’ll handle it well,” Murin said. “It’s just a wrestling tournament. I’ve wrestled probably thousands of them in the past. I’m still strapping on my shoes, just going at it and having fun. I just want to dominate as much as possible. The only one that can beat me is myself. I feel like I did what was necessary to win a state title, and now it’s time to prove it. As you can tell, Murin has turned into a very confident wrestler, which he says has been part of his growth as a wrestler. Murin, of course, signed to wrestle for Iowa before the season started. On Sunday, he was watching the Hawkeyes finish third in the Big Ten Championships. He can’t wait to get to Iowa. Before then, he’ll be going after that second title. And then Nikolishen will have a major hole to fill next season.